In the past, each issue of ANS focused on a particular topic that we announced more than a year in advance! This tradition had advantages and called forth scholarship that might otherwise go unnoticed. But it also constrained our ability to publish important scholarship that was related to our purposes as a journal, but that did not conform to a pre-determined topic! 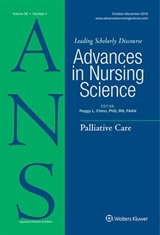 Now we have the best of both worlds – each issue includes articles that address a particular topic, but also articles related to other topics but that are consistent with the journal purpose to advance the development of nursing knowledge. So regardless of your topic, if your manuscript is consistent with our journal purposes, we welcome your submission! Also, pay attention to our list of projected featured topics – always available in the right sidebar on the ANS website. We might just inspire you to develop your ideas related to thee topics in a publishable article!